We’ve put them all in a pretty cool infographic for you at the bottom of this post. “Eighty-three percent of marketers said they’d like to create more video content if they didn’t have restraints such as time and resources. We also found that 30 percent of marketers are looking to spend more time focused on Facebook video in 2017, with 28 percent also looking to add YouTube to their marketing stack. Here at Cool Cats Video we see that as a HUGE opportunity. We know it NOT hard at all. We know how to make it so it is EASY, cheap, fast and results in attracting and converting perfect clients at a profit. So, when you’re ready to totally nail this video marketing gig…….. we’re here to help. 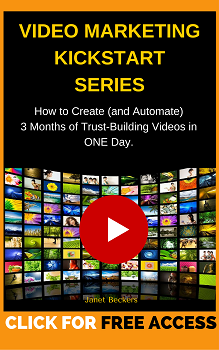 A great place to start is our FREE Video Marketing KICKSTART Program. Want the BIGGER Infographic? Click here to open it up. You can share this post on social media. Janet is a multi-award winning online marketing strategist, author, speaker and mentor who is known for making the complex simple with a healthy dose of reality and humour. Janet is the founder of Cool Cats Video Marketing Academy. You can connect with Janet and find out more about here over at www.JanetBeckers.com .